Economics. Are you bored yet? That is the problem. So few people know anything about economics that it seems any one can say anything and get away with it. Economics is a science that makes no judgments about good or bad and that has no goals. It is just a tool for understanding the world we live in. Just as a hammer does not care if it is used to build a beautiful home or a gallows or bash some ones head in, economics can be used for a variety of purposes. The July 19 issue of Forbes magazine has an article, Where Inflation Lurks. It is unremarkable except that it may be the most inane piece of garbage I have read in a year where a great deal of inane garbage has been written. I will get to that later but for now I would like to talk about why the article was written. The short answer is politics but the long answer is hearts and minds. Toward the end of WW2 there was great concern that the world’s citizens were dissatisfied with capitalism. A series of summits were held, the most famous Bretton Woods, to revive both the image and structure of capitalism. Economics became a tool in defeating the communist. Naturally it was necessary to purge academics who disagreed with the new party line. This led to a purity of American thought. Thus economics ceased being purely a science and became a philosophy. People learned economics, free trade, unfettered markets as a prophylactic against communism. The Communists are gone but the battle continues. In hard economic times the people might be tempted to embrace government regulation of the markets and they may even consider socialism, so the capitalist propaganda machine is fighting back. “Fear of loss is a greater motivator than possible gain.” Every student of human behavior is aware of this maxim. So if you really want to change people’s behavior you must inspire fear. CNBC. Reporting that Obama had ordered the Treasury to print one billion dollars in cash. She lamented this was going to set off massive inflation. Now I assume that Ms. Burnette knows that cash is an extremely small part of the money supply. I am guessing she also knows that printing money does not increase the money supply but it does allow people to change one form of money for another. Further I expect that Ms. Burnette also understands that most money is credit and that when credit defaults money disappears and we lost trillions not billions. So what the hell was she talking about? The Wall street Journal that bastion of journalistic excellence was next to join in. June 11,2009 http://online.wsj.com/article/NA_WSJ_PUB:SB124458888993599879.html. I hope Mr. Laffer invested in gold because he set off the most irrational gold rush in history. To summarize Obama was going to create massive debt so large that the U.S. would have no choice but to print massive amounts of cash and pay the debt with the cash. As proof he pointed to the Wiemar Republic and Zimbabwe. In defense of the Wiemar Republic it had problems not of its own making and economics was not at the time well understood and Zimbabwe is a country dictated by a madman. Mr Laffer predicted that Obama would inevitably make completely irrational decisions and that inevitably an economic holocaust would follow. Forget that for over two hundred years the US has enjoyed an excellent credit rating. It was all coming to an end. This was reinforced by the National Inflation Association http://inflation.us/awashedwithdollars.html. I have always assumed that the Inflation Association is funded by people who once but no longer own gold stocks. For over two years the business media have been beating the drum. So where is the inflation? Currently as inflation is measured there is a low rate, possibly 2%. That is high, the “basket” has always been inadequate. There is evidence that real estate is still depreciating, unemployment is very high which puts downward pressure on wages. That is the opposite of inflation. The U.S. is still largely a deflationary economy. That brings us back to the Forbes article.” It is coming “the article says and here is why:” Cost of shipping, regulation and health care are rising.” –Inflation you may remember is an excess of money supply. If the cost of the things listed rise and the number of dollars remains constant (certis paribus for all you economics geeks)There will be a shortage of dollars. Then economic activity decreases. That means a recession, rising unemployment and falling prices which is again the opposite of inflation. To the credit of the Business Press the fear they have instilled has made it very difficult for the Obama administration to deal with the crisis. In the first place the stimulus was far too small. Health care reform was limited by frugality, and Wall Street Reform was watered down. So though they have done nothing but lie to us it has been successful. We decided a long time ago not to endorse candidates in the primary. That means we don't un-endorse, either. In such a perverted environment, I believe we have a duty to stop the descent into tyranny, even if that means supporting a candidate who falls short of our ideal. In other words, the St. Louis Tea Party has preemptively decided to support Roy Blunt in the Republican primary, but is not honest enough to say so in their statement to the Post-Dispatch, which is an incoherent claim that they can't sign a letter saying they haven't endorsed Blunt because they have a policy of not endorsing candidates. Adam Andrzejewski is a “reform activist,” according to The Daily Herald. According to people I’d trust with my life—or my kids’ lives—he’s about America, the Tea Party ideals, Illinois, and a whole bunch of other things before you get to GOP. That might not sit well with career Republican activists, but should sit well with independents, conservative Democrats, and Republican voters. Not to mention the center-right coalition that includes Libertarian and Constitution Party members. Illinois is a key partner for Missouri. Dealing with the corrupt, nearly bankrupt mess left by Blagojovich is too much work for an ordinary politician. But the Tea Partiers are cut for this kind of crap clearing. And we’ve been preaching the need to win primaries for real reformers. Andrzejewski is the real reformer in this race. Let’s go all in. Let’s help clean up Barry’s home town. I’ve heard that another candidate in the race is claiming to be “endorsed” by tea parties. It’s a crock. Adam Andrzejewski is the only organic Tea Partier in the race. And while there’s no polling data of any kind from the last week (that I know of), a review of mentions on twitter, facebook, Google, and Technorati all show a marked increase in energy and attention for Andrzejewski in the past week. But enough to win? On January 31, Hennessy hilariously claimed that Andrzejewski was "surging." Dana Loesch also supported him on her web site. And even after Andrzejewski was completely crushed in the Republican primary, Hennessy said on the St. Louis Tea Party web site "Let's Celebrate Our Accomplisments" and pointed to the fact that Andrzejwski did well in Madison county. In other words, it was pretty clear that the St. Louis Tea Party endorsed and pushed for a candidate in the Illinois Governor's Republican primary race. So their excuse that they "don't endorse in Republcian primaries" is false, in addition to being a non sequitur. Loesch Doesn't Bother Doing The Most Basic Research Before Calling Sherrod's Story 'False"
The article she links to is offensive and idiotic. Sherrod had said that one of her relatives was lynched in the past. The author of the article, former Reaganite Jeffery Lord, called Sherrod's story "false," and attempted to support this assertion by quibbling about the meaning of the word "lynched." He agrees that her relative was beaten to death by an angry group of racists, but somehow thinks that it's only lynching if it involves a noose. First of all, this is an absolutely obnoxious, ridiculous point to quibble about. Her relative was beaten to death by a group of racists! I think that was the relevant part of what Sherrod was trying to convey. Second, Lord, and by the sacred laws of retweeting, Loesch, are also idiotic because in making this completely obnoxious point they also happen to be flat out wrong. As was pointed out by Lord's colleague in the Weekly Standard John Tabin, lynching is defined as, " extrajudicial killing by a mob (which can be as few as two people)." As Tabin writes, and as should be obvious to all, "the fatal beating of Bobby Hall most certainly qualifies." Furthermore, Tabin's post was up on Monday and has been much discussed online, so if Loesch even had the dimmest awareness of this conversation or the ability to use google, she could have found out that she was about to link to a humiliating article. At the end of last week, Dana Loesch claimed multiple times that she would be "breaking" news with St. Louis Circuit Clerk Mariano Favazza. Favazza had a story complaining that he was offered a compromise of being allowed to keep his position for 10 years before the position moved from being an elected office to being an appointed position, a change he was opposing. Loesch tweeted that she had "breaking news:"
She also posted on facebook that she was "breaking news" and claimed that it would "rock the city:"
In fact, even during the interview, she called it "breaking news." Except that it wasn't. Loesch's interview with Favazza was on Friday, July 23, and the exact same story had been on the Post-Dispatch website the day before, June 22. So the only thing "broken" was the last shred of Loesch's credibility. What I want to know is what Favazza, a Democrat, is doing pitching his story on her show. Appearing on Loesch's show is not exactly a good way to gain credibility for any endeavor. The St. Louis Tea Party is scrambling to defend their decision not to join with 28 other Missouri Tea Party groups who all spoke out strongly against the idea that Roy Blunt fits with the tea party's professed small-government ideals. Most state tea party groups dislike Blunt because of his votes on issues like the big bank bailout, Cash for Clunkers, and No Child Left Behind, but the St. Louis tea party leadership decided long ago that they were content to be merely a front group for the establishment Republican Party, as long as they could continue to get booked as pundits on CNBC and CNN. And it may seem highly counter-intuitive, but for this specific election cycle where so much is on the line, we can’t forget that “perfect” ideological candidates (candidates who are “perfect” on all of our issues) aren’t always the best choice at the polls in the primaries. Mark this well: nothing is more important this election than preventing Socialists from getting elected. To achieve that end, we need candidates that can win. In that sense, the “perfect” candidate isn’t always the best candidate. It won’t profit us a thing if we have the most perfect ideological candidate in the world who can’t beat the Socialists this November. This is pretty interesting in relationship to Roy Blunt. It seems to me like a strong argument could be made that Chuck Purgason would have a better chance of winning in November, given Blunt's record of voting for bailouts and a load of other baggage. The only real advantage Blunt has over Purgason is boatloads of money. So, essentially, Burns is saying that you should ditch the better candidate in the primary in favor of the candidate who has the most money (by necessity, the GOP insider). Quite a bizarre philosophy from a guy who previously portrayed himself as so pure that he claimed anyone who supported public transportation was a "socialist," including the Republican Mayor of Chesterfield. Some of our friends in the Tea Parties are engaged in primary battles, and in their zeal to win, they are making false statements about the unity of the Tea Party movement behind particular candidates. Respect goes two ways. Please remember that. The reaction to the St. Louis tea party's defense of shameless pandering has not been positive. Gee, you think maybe this is part of the reason why 28 tea party groups across Missouri sent out a press release making it clear that they don't endorse Roy Blunt? I hope Congressman Blunt doesn’t think tea partiers are uneducated, toothless, blue- and brown-collar rubes who live in homes with dirt floors and only recently heard that World War II is over. If he does think that, he is wrong. In fairness to Blunt, when you're an important D.C. insider like him, it's probably very hard to keep track of what people outside the D.C. Party circuit are like. We decided a long time ago not to endorse candidates in the primary. That means we don't un-endorse, either. The Tea Party, being totally decentralized, represents a lot of ideas and opinions. We love that. We love that so many passionate conservatives have gotten involved in the process. The following list of Tea Party organizations, from across the state of Missouri, have NOT endorsed Roy Blunt in his campaign for the U.S. Senate seat. Since the St. Louis tea party did not formally endorse Roy Blunt, they obviously could have signed the letter, but they didn't because they didn't want to give the impression that they were criticizing Blunt. Roy Blunt voted for TARP and Cash for Clunkers. For Michele Bachmann to come to Missouri and give the impression that all the Missouri Tea Parties support Roy Blunt is an abomination of everything we have been standing up for. Notably absent is the St. Louis Tea Party, who as I've pointed out many times, threatened to "go after" Blunt if he didn't support Doug Hoffman in New York 23 but then were too cowardly to do anything when Blunt completely brushed off their threat. The St. Louis Tea Party is different from most other tea parties in many ways: one of which is that they are more willing to simply be an arm of the Republican Party establisment rather than a group that actually demands that Republicans live by their stated values. Perhaps that's why they brag about ostracizing any fellow conservatives who ask questions about their group. Ensuring Liberty Claimed, in May, that Caucus Members Would Be Announced "Soon"
I wrote last week about how the much-hyped Ensuring Liberty Caucus, created by St. Louis tea partiers Bill Hennessy and John Loudon, among others, appears to be a huge failure. Well, I just stumbled across some new information that supports that claim: back when the website was first created, they put up a page for the "caucus" (supposedly members of the House of Representatives) and said that members would be identified "soon!" Well, guess what? I just checked out the page, and it looks exactly the same now, 2 months later. It looks like Michelle Bachman really did stab the tea party in the back when she created her tea party PAC. I've noticed online that several prominent tea partiers have accused Bachman of "co-opting" the tea party movement with the PAC, but you wouldn't have known that from Dana Loesch's sycophantic interview with Bachman. We already knew that Loesch was happy to personally gain financially from supporting GOP insider candidates, but it's interesting that she couldn't even speak up on behalf of her fellow St. Louis tea partier's project Ensuring Liberty when she spoke with Bachman. Finally, one other interesting note: after I wrote my last post pointing out that Ensuring Liberty hadn't updated their facebook page since June 19 and their Twitter account since June 16, they finally put up new information on both on July 19, just two days after my post. Very nice to see that they are so concerned with criticism from my blog! Since you are heeding my advice so carefully, oh facebook page admins for Ensuring Liberty, would you mind also trying a new strategy of posting something that's true? Just a thought. Hennessy Baselessly Claims Sherrod Has "Seething Anger Toward Everything That Doesn't Hand Her Cash"
Of course, there is no evidence whatsoever that Sherrod is "angry" at "everything that doesn't hand her cash." But in the tea party's black and white worldview, she's in the out-group, and so they now think it's perfectly OK to use the most despicable stereotypes to try to smear her reputation. Monday, July 26, the St. Louis Young Democrats are having their monthly meeting at 7 PM at Maggie O'Brien's (2000 Market Street) featuring, among other things, a presentation by your truly about how we can respond to tea party online organizing. Also Monday, the film Ingredients will be showing at the Schlafly Bottleworks as part of the Slow Food on Film Series at 7 PM. Also Monday, there will be a community meetup with Pride St. Louis at MoKaBe's Coffeehouse (3606 Arsenal) from 7 to 8 PM. Tuesday, July 27, there will a lunch discussion of Proposition S at the St. Louis Board of Education from noon to 1 PM. Also Tuesday, the YWCA Phyllis Wheatley Heritage Center will be hosting a Job Fair from 2 to 6 PM at 2711 Locust St.
Also Tuesday, Earth To Congress! People care about the environment! Join a phone bank at Repower Missouri from 8420 Delmar at 4 PM. Also Tuesday, the last to show first to go happy hour benefit at the Schlafly Tap Room (2100 Locust) from 5 to 8 PM will raise money for Architecture for Humanity. Wednesday, July 28, there will be a protest outside of the St. Louis Children's Hospital (4444 Forest Park Avenue) from noon to 1 PM for needlessly using cats and ferrets for intubation training when even the American Heart Association says that manikins are as effective. Also Wednesday, a new Meditation for the Queer Community will be starting at the LGBT Center of St. Louis (625 N. Euclid) from 7 to 8 PM. Also Wednesday, the Beep Beep Bling Bling Dance Party from 9 to 11 PM will be raising money for the Community Arts and Media Project (3026 Cherokee). Thursday, July 29, the So Reel film series at the YWCA Phyllis Wheatley Heritage Center continues with a discussion of white privilege starting at 5:30 PM. Also Thursday, there's a fundraiser for state senate candidate Don Calloway from 6 to 7 PM at 4411 McPherson. Also Thursday, the movie Rethink the Afghanistan War will be showing at the Trinity Lutheran Church (801 Blair) in Alton, Illinois at 7 PM. Also Thursday, there's a meeting for those interested in Urban Homesteading at 7 PM at CAMP (3026 Cherokee). Also Thursday, there will be a spaghetti dinner for the St. Louis arts community at Arcadia Studios (4528 Ohio) from 7 to 10 PM. Also Thursday, Philosophy Professor Mark Rollins will be speaking about Perception and the Evolution of Art at the Craft Alliance Grand Center (501 N. Grand Blvd) from 7 to 11 PM. Also Thursday, there will be an "Ugly Party" fundraiser for the Urban Studio Cafe at the Sol Lounge (4239 Lindell) from 9 PM to 3 AM. Friday, July 30, there will be a Car War raising money for the Alzheimer's Association of St. Louis at Huck's Gas Station (on Patterson in Florissant) from noon to 3 PM. Also Friday, it's the 21st Annual Jefferson County Day with the Democratic Central Committe at 1200 West Gannon Drive in Festus, MO, from 4 to 11 PM. Saturday, July 31, there will be a FARMS ROCK benefit for EarthDance Farms at the Duck Room in Blueberry Hill (6504 Delmar) from 5:30 PM to 12:30 AM. The lineup includes: Alvin Jett & Phat Noiz, Dogtown Allstars, Blue Tapp, Firedog, The Disclaimers, Celia's Big Rock Band, and Last to Show First to Go. Also Saturday, there will be a Trivia Night for VSA, a state organization for Arts and Disability, at DeSmet Jesuit High School (233 North New Ballas Road) from 6 to 8 PM. Sunday, August 1st, and every Sunday, there will be a vigil for peace at the corner of Lindell and Grand. Instead of having Loesch on next time, maybe Larry King can just prop up a big sign that says, "YOU'RE ALL MARXISTS!" You probably know by now that an absolutely disgraceful episode happened this week involving serial liar Andrew Breitbart. Breitbart posted a video clip claiming that USDA employee Shirley Sherrod was "racist" because she said in the clip that she was hesitant about helping a white farmer. Shamefully, the mainstream media and the White House did not initially fact-check Breitbart's claims, and the Secretary of Agriculture Tom Vilsack asked for Sherrod's resignation. The video, however, turned out to be a complete misrepresentation of the truth. Sherrod was telling the story to emphasize how her feelings had changed, and how she learned, "when you're poor, no one wants to help you, no matter your race." In fact, she saved the man's farm. Breitbart was engaged in shameful, despicable race-baiting based purely on lies and distortions. Sherrod seems to be making the case that this administration and the NAACP have created an environment of hyper-racial … awareness, for the lack of a better word, antithetical to the post-racial promise upon which the admin ran – and it claimed a casualty as a result. This is a complete and surely intentional misreading of Sherrod's quote. Sherrod was saying the reason the tea party targeted her was to try to make the NAACP look bad, not that the NAACP "had created an atmosphere of racial awareness." But Shirley Sherrod was wronged. She was wronged by Barack Obama, the hyper-racial President who has worked overtime to create racial hostilities. She was wronged by Ben Jealous and the participants of the NAACP’s recent convention whose malicious and bigoted lies about Tea Party attendees demanded Breitbart’s (and others) search for truth. Apparently, it was all the NAACP's fault that Hennessy called Sherrod a "filthy, disgusting woman" and a "racist:"
Get that? The tea party and Breitbart, following their never-ending quest to try to incite the white victimhood complex and use racism for political gain, goes out of their way to lie about Sherrod. And then, when they are caught in a blatant lie, they turn around and say it was all the NAACP's fault for "raising awareness" of race. The St. Louis tea party, over and over again, intentionally plays off the white victimhood complex to try to motivate their shrinking base. This is nothing new. But what's truly amazing is that the media is so willing to continually give them a microphone to act out their cynical nonsense, even after they are caught lying. 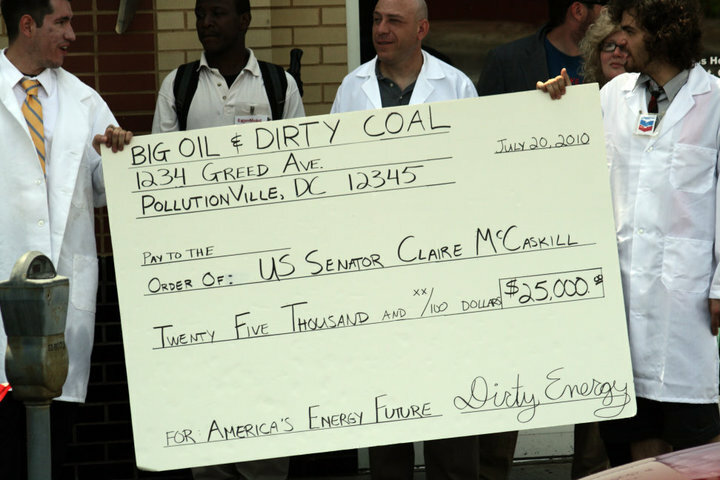 Activists dressed as oil and coal executives presented a large check signed by BP, Peabody, and other dirty energy companies to highlight the influence of dirty energy money in politics. In recognition of the ongoing devastation in the gulf, demonstrators performed an oil “spill-in,” blocking traffic for 10 minutes, and then asked the Senator to choose a side. We will continue to pressure Senator McCaskill to cross the line and support clean energy. We must retake our future from the pockets of Big Oil and Dirty Coal. Senator McCaskill, Be a champion: We demand you CROSS THE LINE and side with the PEOPLE, not polluters! The coalition that staged today’s event included Climate Action St. Louis, Missourians Organizing for Reform and Empowerment, Missouri Student Environmental Coalition, St. Louis Instead of War Coalition, Student Sierra Coalition, Washington University Climate Justice Alliance, Green Action, 1Sky, Labadie Environmental Organization, and the Catholic Action Network. Today I expressed my concern that the SCOTUS is on its way to over riding Presser V Illinois. From a strictly constitutional perspective I believe the over ride is correct and certainly a logical extension of the ruling that guns are an individual and not a corporate right. For those unfamiliar Presser was a ruling regarding private militias. According to the ruling 1)gun ownership is a corporate right which is allotted so that individuals can serve their role as militias to defend the nation against enemies foreign and domestic. 2)Militias are thus not the right of a private citizen but are to be regulated by the States. It seems to me that McDonald V Chicago has struck down the reasoning behind Presser. While I think the ruling was flawed I also think Presser preserved the Union. It was only twenty years after the Civil War and the arms escalation and violence of Management versus Labor was on its way to becoming nearly as dangerous. In today's environment I fear that overturning Presser may bring us back to the brink of war again. Specifically I fear armed conservative militias seeking out liberals, LGBT's, Union members, providers of health care to women and scientist. As to your assertion that conservatives do not violently seek out liberals. That is a lie. Ask Dr. Tiller, ask the numerous other victims of the pro life movement, ask current providers what it feels like to know that Fox News encourages murder, ask gay men and woman who are beaten and killed, ask scientist if they feel safe. Ask yourself how many times on a chat line have you seen a conservative tell a liberal that they are well armed and prepared to kill. As for protecting freedom; Libertarians yes, conservatives less often. What was the first act by conservatives suspending the Constitution? Alien and Sedition Acts in 1798. Certainly the conservatives were represented by the Confederacy who declared war on the United States in their effort to deny freedom. Lets not forget the conservative mayhem unleashed after the end of Reconstruction. Five million blacks driven from the South, how many lynchings? The first Red Scare. "Historian Murray B. Levin wrote that the “Red Scare” was “a nation-wide anti-radical hysteria provoked by a mounting fear and anxiety that a Bolshevik revolution in America was imminent — a revolution that would change Church, home, marriage, civility, and the American way of Life.”  Newspapers exacerbated those political fears into xenophobia — because varieties of radical anarchism were perceived as answers to popular poverty; the advocates often were recent European immigrants exercising freedom of speech protected under U.S. law, (cf. hyphenated-Americans). Moreover, the Industrial Workers of the World (IWW) effected several labor strikes in 1916 and 1917 that the press portrayed as radical threats to American society inspired by left-wing, foreign agents provocateur; thus, the press misrepresented legitimate labour strikes as “Crimes against society”, “Conspiracies against the government”, and “Plots to establish Communism”.--sounds like the rhetoric of the Tea Party to me. Sedition Act of 1918 to protect wartime morale by deporting putatively undesirable political people. Law professor David D. Cole reports that President Wilson’s “. . . federal government consistently targeted alien radicals, deporting them . . . for their speech or associations, making little effort to distinguish true threats from ideological dissidents." The Palmer Raids (1919–21) – executed by J. Edgar Hoover, who instructed that said political prisoners be forcefully interrogated without legal counsel, and that they remain imprisoned via prohibitively high bail. Wow as a conservative I bet you are proud of your man Joe. War on drugs? Two million Americans currently imprisoned. Murder and force is the conservative way only Libertarians and Liberals protect the Constitution from conservative zealots. Ed Martin and Roy Blunt on Watchdog's List of "Crooked Candidates"
Citizens for Responsibility and Ethics in Washington (CREW) has come up with a list of 11 "Crooked Candidates" (including both Democrats and Republicans) and, wouldn't ya know it, we've got two right here in Missouri. FiredUp Missouri has the story. 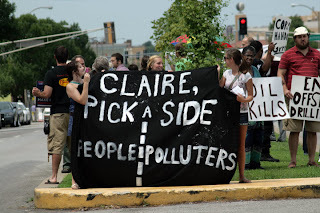 Tuesday, July 20, There will be an important rally outside of Senator Claire McCaskill's office (5850 Delmar) telling her to take a stand against polluters at noon. 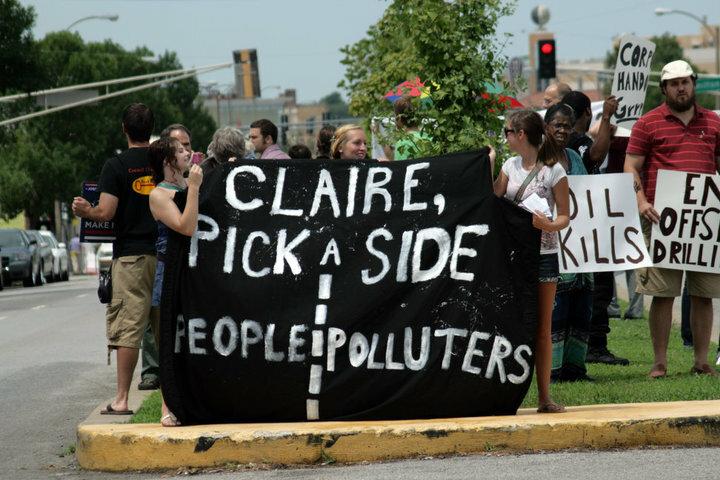 Specifically, we are asking for Claire to (1) support an offshore drilling moratorium, (2) support a federal subsidies shift to renewable technologies, and (3) reject campaign contributions from Big Oil & Coal. It's long past time for change! Also Tuesday, the film Drugs and Death at Bagram will be showing at the Tivoli as part of the St. Louis Filmmaker's showcase at 5 PM. Check the St. Louis Activist Hub wall for more info. Also Tuesday, you're invited to canvass with an excellent candidate for the Missouri House of Representatives, Deb Lavender. The canvass starts at 5 PM at Des Peres Physical Therapy (1133 Colonnade Center Drive). Wednesday, July 21, a group of people interested in taking action to prevent an unjust foreclosure will be gathering at the World Community Center (438 N. Skinker) at 9:30 AM. Also, Wednesday is the date for the July Green Drinks, a chance to relax with people who care about the environment. This month's green drinks focuses on Art and Ecology and will be from 6:30 to 8:30 at the Schlafly Bottleworks. Also Wednesday, there will be a town hall to discuss St. Louis Area LGBT Homeless Shelter Initiatives from 6:30 to 9 PM at the Central Reform Congregation (5020 Waterman). Also Wednesday, Women's Voices Raised for Social Justice will be showing Against All Odds, a documentary about East St. Louis, at 6:30 at Meramec Community College , Kirkwood -lecture hall room 103. The filmmaker Sandra Pfeifer will be there to take questions. Also Wednesday, there will be a party at Tres Hombres in Carbondale, IL for the repeal of Don't Ask Don't Tell starting at 9 PM. Thursday, July 22, join the ACLU for a presentation on Racial Profiling and Preventative Policing featuring Dr. David Harris of the University of Pittsburgh School of Law from 7 to 9 PM at the Holocaust Museum and Learning Center (12 Millstone Campus Drive). Also Thursday, the film From Mammies To Diva: African American Actresses in the 1920s to 40s will be showing at the Missouri History Museum at 7 PM. Friday, July 23, there will be a Trivia Fundraiser for Terri Williams, Democrat for St. Louis County Council, at the Webster Groves Rec Plex from 6:30 to 10 PM. Saturday, July 24, there will be a 3-on-3 Basketball Tournament and Community Fair at Fairgrounds Park (Natural Bridge and N. Grand) from 10 AM to 4 PM. Also Saturday, there will be canvassing throughout the day for the Democratic Party in the Saint Peters area starting at 235 Jungermann Rd at 10 AM. Also Saturday, the Missouri History Museum will host Working Like a Dog: A Look at Support Dogs at 11 AM. Also Saturday, the Education for Social Justice group will be meeting at Jilly's Cupcake Bar (8509 Delmar) for a casual get-together from 1 to 4 PM. Also Saturday, there's a 'Colorful' Blogging While Brown STL Tweet-Up at Cafe Mochi (3221 S. Grand) from 4:30 to 6:30 PM. Also Saturday, there's a Metro East Pride Meet n Greet at 133 West Main in Belleville, IL from 6 to 9 PM. Saturday and Sunday, it's the City Wide Open Studios sponsored by the Contemporary Art Mueum. Sunday, July 25, there will be a special benefit from noon to 8 PM for Suzie Martin, who has been facing difficult medical challenges, at the Patio @ Novak's (4121 Manchester). Many different artists will be performing! Also Sunday, Schlafly Bottleworks will be showing Ingredients as part of the Slow Food Film Series at 7 PM. Also Sunday, there will be a Community Meet-Up for Pride St. Louis from 7 to 8:30 at MoKaBe's Coffehous (3606 Arsenal). 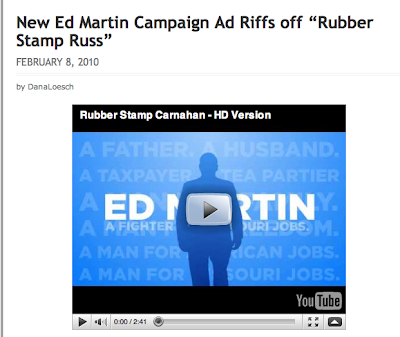 Alan Colmes to Ed Martin: "With all due respect, you're not telling the truth!" I was used to seeing Colmes getting pushed around back when he was co-host with Sean Hannity on Fox, so it's cool to see him smackdown Ed Martin's absurd arguments that President Obama and Russ Carnahan are trying to prevent people from "finding salvation." (2:11) Colmes : Mr. Martin, you are not being stopped from worshipping and being a Christian, are you? Are you less of a Christian because Obama is in office? How is your freedom of religon being taken away from you? Martin: Alan, you're not listening. Colmes: No, I'm not hearing anything that makes sense! (3:32) Martin: And one of the things they intrude on is my freedom of religion, my freedom of speech..
Colmes: Your freedom of speech? Is your freedom of speech being compromised? Colmes: There's no fairness doctrine. Now hold on. First of all, I'm against the fairness doctrine, sir. Number two, you are misrepresenting...there is no attempt, no effort to bring back the fairness doctrine and you know it. Please don't misrepresent that argument. I know that issue very well. Excuse me sir, the Democrats have been in office now for two years. They've been in charge of the House actually longer than that. There is no attempt, there has been no attempt, and they're on record as saying there will be no attempt to bring back the fairness doctrine. Do not misrepresent what they're doing. You're wrong on that. (4:17) Martin: Well, listen Alan, what we have is a President that told us just a mere two or three months ago that he would not let taxpayer dollars go to abortion. Martin : What about what Governor Rendell did yesterday??? (5:26) Colmes: Is anybody forcing you to pay for an abortion or to have an abortion? Martin : My tax dollars are going for abortions!!! Colmes: Your tax dollars are not going to abortion. So, is there any other way in which your religion is being infringed upon? Colmes: They haven't taken over health care. I wish they would but they haven't done that. Colmes: They haven't taken over health care. There's not a public option. There's not single-payer. What are you talking about? Colmes: But you're misrepresenting the facts! (6:58) Colmes: Would you agree, sir, that taxpayer dollars even prior to Obama did go to pay for abortion? Colmes: Didn't that happen under George W. Bush as well? Wait a minute. Wait a minute! You're statement is that Obama in particular is taking freedoms away that you previously had. Colmes: When the same policies with taxpayer dollars existed under George W. Bush whom I bet you supported, so exactly what freedom was removed by Barack Obama? Colmes: You're playing a game of three card monte. Ed Rendell is not Obama or Carnahan and the tax dollars going to pay for abortion existed prior to Obama. You are playing a slippery game, sir, and you are misrepresenting the facts! With all due respect, you're not telling the truth! That last quote pretty much sums up the appropriate response to Ed Martin's congressional campaign. Or at least she believes it's our duty as Patriotic Americans not to think about whether people are being killed in Afghanistan. penn i am so totally your biggest fan but omg i cant believe that you disagreed with me so here let me say a bunch of cliches about afghanistan that completely ignore the fact that you read the news and are not asking for mindless platitudes but for actual concrete benchmarks. also here watch this clip of me nodding and saying "yep" in agreement with you for over 2 minutes, see we agree all the time and you really should share some of your twitter followers with me. in conclusion, omg you know zz top? you're just like way too cool for me. just kidding, no i'm not, yes i am. I can tell you how I would like for it to end. I think Petreaus is going to get us in and get us out. Finish the job, get out. Make sure that they have a stable government, we have people over there that are voting. Women are being freed; you don't have many progress without struggle some time and I'm glad we didn't turn a blind eye to the struggle over there. As a woman, I can say that. But yeah I like Petreaus getting in there, doing the job, getting out, bottom line. But, of course, this is exactly the kind of empty rhetoric - completely ignorant of the complicated situation in Afghanistan - that Penn Jilette was criticizing. Still more amazing: even after Jillette criticized her, she failed (5:26) to add any substance to her "critique:"
Let's see, our job in Afghanistan was to stabilize a country that was being ruled by the Taliban, where women and children were being killed daily by the Taliban. Our job was to go over there, Karzai, some people don't like him, some people think he's working all right, he's now the President in Afghanistan, and we turned what was an enemy state, what was a germ bed of terrorist activity, where 9-11 was hatched, we turned this country into an ally as opposed to an enemy. Now it's being stabilized and we're trying to help them maintain their own individual liberty. Because for whatever cracked-out reason, people like to think that Democracy is a patent that is inherent to only white anglo saxon Protestant United States Citizens and it's not. So that's the point I would have made. Again, this completely misses the point of Jillette's question. Of course everyone would like to see a country that has a wonderful flourishing democracy where no one is being oppressed by the Taliban. However, what he was asking was: what are the actual specifics of what the country would need to look like in order for us to decide that it was sufficiently "good enough" for us to withdraw troops, and how can we get to that point? And Loesch, of course, does nothing to answer those questions. There are so many things wrong with her response. First of all, Jillette said that we were killing people, and she tried to twist the comment into a claim that the only thing we were doing is killing people. Nope, sorry, two completely different English sentences with two completely different meanings. Second, she immediately tries to turn this into an attack on the troops, when it clearly was a critique of U.S. policy. Troops are generally expected to follow the orders of their commanders in spite of their own political beliefs. But countries can make mistakes. So, as anyone with a brain realizes, it's possible to criticize a country for going to war without thinking that the troops are responsible for the bad decision and the consequences that result. But of course Loesch like all good neocons likes to hide her hawkish positions behind the troops in order to stifle debate. And finally, there could be no more telling quote about Loesch's approach to politics than her statement that she wouldn't "accept the premise" that women and children are being killed. It's one thing to say "yes, it's true that innocent people are dying as a result of our military activity, but more innocent people would have died if the Taliban was still in charge." But Loesch doesn't even have the intellectual honesty to make that claim: instead, she pretends that no innocent people are being killed at all. I'll conclude by noting that I really don't have my mind made up about Afghanistan. I see a lot of problems with us pulling out of the country, but I also have not seen a clear plan for how we can be successful in creating a stable, democratic country given the current dynamics. But if we're going to have an honest debate that attempts to make the best decision, it's important that we don't simply turn a blind eye to certain facts just because they don't fit with our preconceived ideology. It's extreme, but it's comparasing policies. Wow, what to say about this? Can anyone think of a word that rhymes with comparasing? Back in October of 2009, the St. Louis Tea Party held a small rally at St. Louis City Hall demanding that all of the Missouri Republican office holders endorse Doug Hoffman over Dede Scozzafava in a NY-23 Congressional Race. Bill Hennessy and Dana Loesch, the two speakers at the event, gave the office holders a deadline and Loesch said specifically to Roy Blunt that they would be "coming for" him if he didn't endorse Hoffman. In fact, she said, "we will vote you out! We will come at you with so much heat, you won't even know how to handle it!" The deadline passed and Roy Blunt completely ignored their demand. Since that time, Loesch and Hennessy have been largely silent about Blunt in spite of their threat. Loesch has at least had Chuck Purgason on her show as a guest a couple times, but has not done anything to back up her "we will come at you with so much heat..." posturing. Hennessy hasn't said a peep of criticism of Blunt since then. But he did finally put a poll of up on the St. Louis Tea Party website asking people what they thought of the primary. The poll was to last until last Friday. And, as of this time, Chuck Purgason beat Blunt in a massive landslide, 64% to 25%. It appears that the membership of the St. Louis Tea Party massively favors Purgason over GOP establishment candidate Blunt. Still, there has been no announcement of the poll results or any comment from Bill Hennessy. It's not clear what else he could want. He gave Roy Blunt an ultimatum. Blunt ignored it (and Purgason, by the way, DID endorse Hoffman). Hennessy polled tea party members, and they overwhelmingly voted for Purgason. He's stated opposition to Cash for Clunkers and the bank bailout, both of which Blunt voted for. So what exactly is holding him back from actually supporting a grassroots candidate that represents the values the tea party claims to stand for? Did Michelle Bachmann Stab The St. Louis Tea Party in the Back? Follow the progress of Ensuring Liberty PAC -- which was launched four months ago at the first National Tea Party Convention -- and you wonder whether this piece is promotion for a project that hasn't been very influential yet. It sure seems like Weigel's point was on the mark. As of me writing this, the front page on the Ensuring Liberty website features a video from May 11. The most recent post on the facebook page is from June 16 (or June 29, if you want to count the postings from board member Bill Hennessy). Their Twitter page has 9 people following it, 4 of whom are board members, and hasn't been updated since June 16. This group that is supposed to revolutionize the conservative movement hasn't even had their act together enough to send out a tweet in the last month. With these principles to guide us, we have assembled a group of leaders currently serving in Congress to hear our voice and keep our First Principles. They are the Ensuring Liberty Caucus. Michelle Bachman and Steve King of Iowa were apparently supposed to be a couple of the members, as they were the participants in the first (and only) Ensuring Liberty "Virtual Townhall." But now Bachman released a press release saying she's starting her own tea party caucus in the House of Representatives. Her caucus is called the "Tea Party Caucus," rather than the "Ensuring Liberty Caucus," so it appears that she's avoiding the name already branded by Hennessy and others in the St. Louis and Quincy Tea Parties. If it is a different group, one has to wonder if Bachmann jumped ship after seeing the sad performance of the "Ensuring Liberty Caucus." If it's intended to be the same group, then it certainly speaks against any claim to being grassroots, since Bachmann's press release makes no mention of the Ensuring Liberty group or any actual "citizens" who played a role in the group's creation. Either way, it will be very interesting to see how much money was raised and where it's actually going. A scholar whom President George W. Bush appointed vice chairwoman of the U.S. Commission on Civil Rights, Abigail Thernstrom has a reputation as a tough conservative critic of affirmative action and politically correct positions on race. But when it comes to the investigation the Republican-dominated commission is now conducting into the Justice Department’s handling of an alleged incident of voter intimidation involving the New Black Panther Party – a controversy that has consumed conservative media in recent months – Thernstrom has made a dramatic break from her usual allies. “This doesn’t have to do with the Black Panthers, this has to do with their fantasies about how they could use this issue to topple the [Obama] administration,” said Thernstrom, who said members of the commission voiced their political aims “in the initial discussions” of the Panther case last year. Oh, and read this post from Joan Walsh too for some more context. Judy Thomas at the Kansas City Star does some actual investigative reporting on the tea party and racism, and I think presents a pretty thorough outline of the discussion. Keep in mind as you read the article that the Council of Conservative Citizens discussed in this article is a known white supremacist group whose website was linked to by St. Louis tea party blogger Gateway Pundit on more than one occasion. He later linked to a video on the White Supremacist website claiming, with no evidence whatsoever, that black children (Hoft called them "thugs") assaulted a white child on a school bus. Furthermore, he kept his link up even after his own commenters complained that it was to a supremacist site. 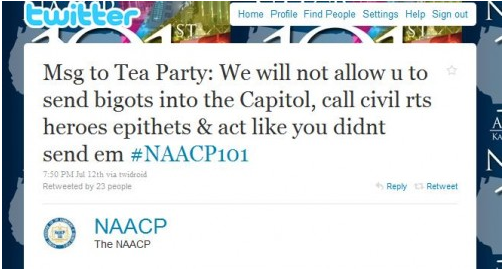 Keep that in mind as the tea party is whining about the suggestion that there are elements of racism in their group. Dana Loesch just published a seething, rambling, name-calling, 1000-word essay on what she calls the "non-issue" that points out the $2,500 dollars her husband's business received from Ed Martin prior to her attacks on Martin's primary opponent. Loesch presents a collection of random facts about the incident but of course basically ignores the central point: that she failed to disclose a potential conflict of interest while she was blacklisting and attacking one of Ed Martin's opponents in the Republican primary. None of the things she said addressed the fact that she failed to disclose that she and her husband financially benefitted from Ed Martin's campaign while she was busy publicly ranting about Martin's primary opponent John Wayne Tucker. As a host of a radio show, she has a duty to disclose any potential conflicts of interest, and she failed in that duty. In fact, Loesch has had Ed Martin on her show many times, and generally not, as she claims, for the troops. She had Martin on March 2nd to talk about a health care forum he was organizing for his campaign. She also had Ed Martin on her show on March 30 to discuss health care. And she had Martin on her show to promote his announcement that he was running for Congress back in September of last year. So it's not entirely clear why Loesch wants to claim that she only had Martin on her show once, but that claims clearly false. It was then perpetuated by a lazy blogger for the Riverfront Times who mistook defamation and libel for content. I knew they wrote about it when I saw that I had a whole three hits from their blog. But, the RFT post didn't even link to Loesch's site, and her husband Chris was ranting about this online on Monday, so her attempt to be aloof didn't quite work out. Anyway, I'll have to keep my eye out for her next 1,000 word rant on a "non-issue." Back in April, the St. Louis Tea Party called for a "buycott" of Ford because Ford was apparently the Last Great Patriotic American Car Company. The tea party was excited that Ford did not take funds from the U.S. government as did General Motors and Chrysler, and thus they considered it a True Paragon of Capitalism, smacking away the hand of the Oppressive Big Government who offered to help Ford stand up. But, alas, this once noble Galtian company has apparently succumbed to the pernicious propaganda of the socialists trying to take over our country, because today it became official that Ford is going to receive $100 million in incentives from the state of Missouri. Apparently their desire to be ruggedly independent did not overcome their desire to get some nice freebies. Will the tea party now call off their "buycott" of Ford? This reinforces once again that the buycotts put on by John and Gina Loudon and the St. Louis tea party are nothing more than p.r. stunts. The Whole Foods buycott was a joke, as evidenced by the fact that prominent tea party leaders were bragging about shopping at Trader Joes a few months later. You know, Trader Joes, the place that sells stuff that's similar to Whole Foods except cheaper? After their initial Whole Foods buycott and a few more p.r. opportunities, the Loudons forgot all about Whole Foods. And after sending their big press release about Ford, they forgot all about it too. These campaigns are not designed to actually change anything. Or, if they are, they are being run by people with no ability whatsoever to actually have a significant economic impact. There's only one thing the buycotts are good at: they do a great job of getting publicity for the tea party, and more specifically for the Loudons. Bill O'Reilly had Zaki Baruti of the Universal African Peoples Organization on to speak about his comments at a press conference earlier in the year. I'll give O'Reilly a little credit: unlike every other right-wing news source that has covered this incident, he actually gave time to someone pointing out that there's another side of the story. If you only watched the other Fox News programs, or read Big Government and the St. Louis Tea Party sites, you would think that everyone was in agreement that this was a brutal beating started by Elston McCowan. There is no such agreement. O'Reilly also said that the way the system works is to let stuff play out in the courts, which is also at odds with the tea party lynch mob that has been clamoring for felony "hate crime" charges against McCowan and Molens with literally no argument to support the suggestion. And predictably embarrasses St. Louis. Check out the "Say What?" segment starting at the 1:18 mark. I guess you can say anything!